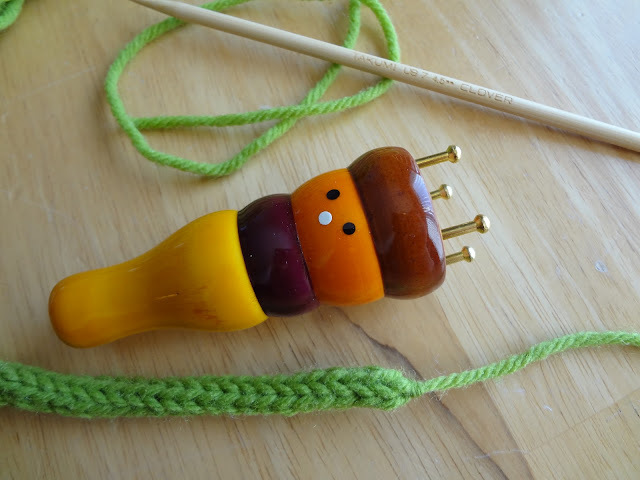 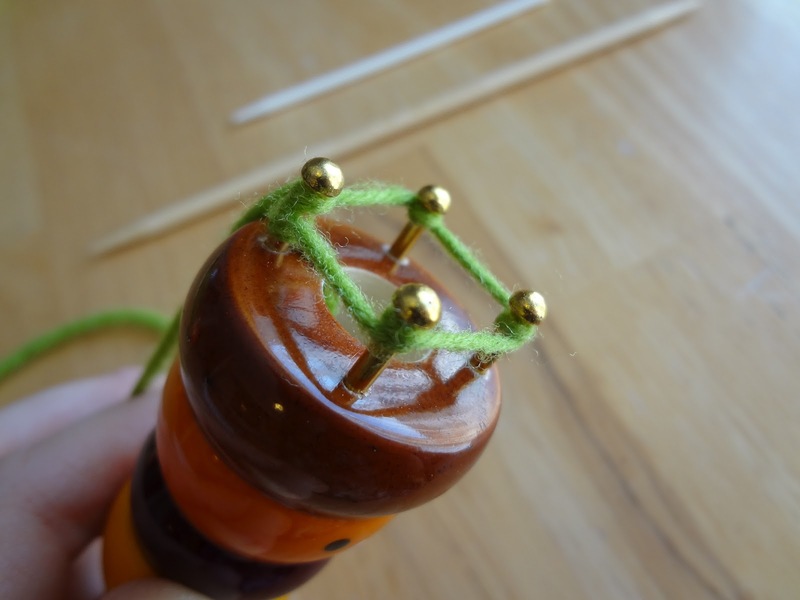 I got this cute little guy for a gift recently and had to share...Here is a fun tutorial you can use to make your own i-cords—before learning how to use one of these, I was only using DPNs, so I am now proud to say I have another interesting knitting skill in my pocket! 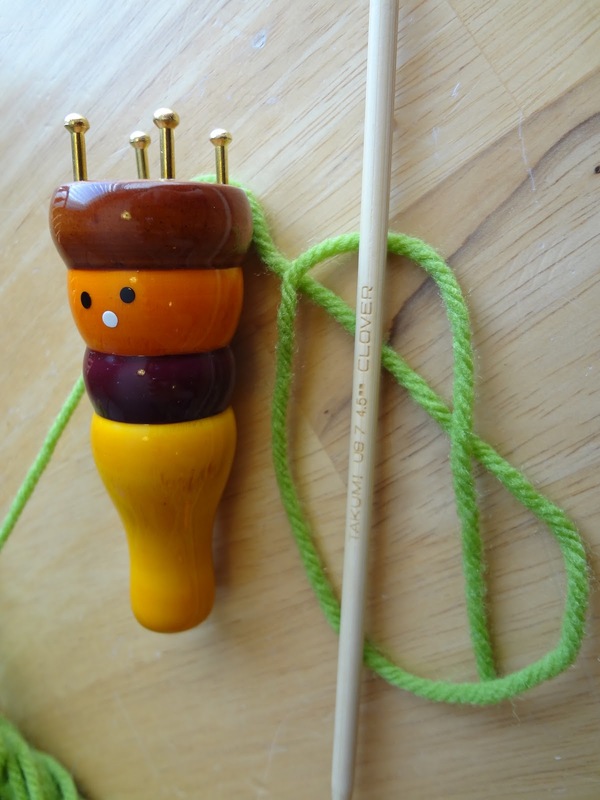 OK, let's begin...I will be demonstrating on Lion Brand's knitting spool. 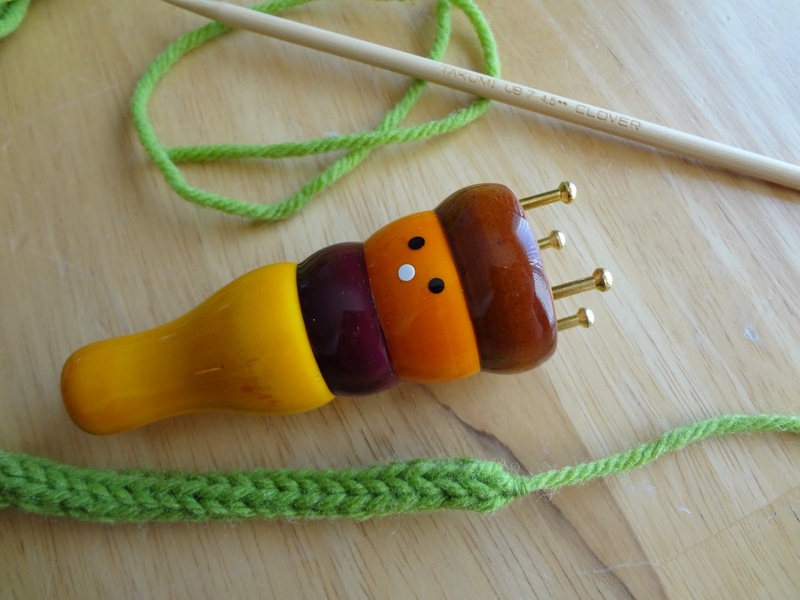 As a side note, I learned recently that these little guys have a plethora of names: French Knitter, Knitting Spool or Knitting Nancy. 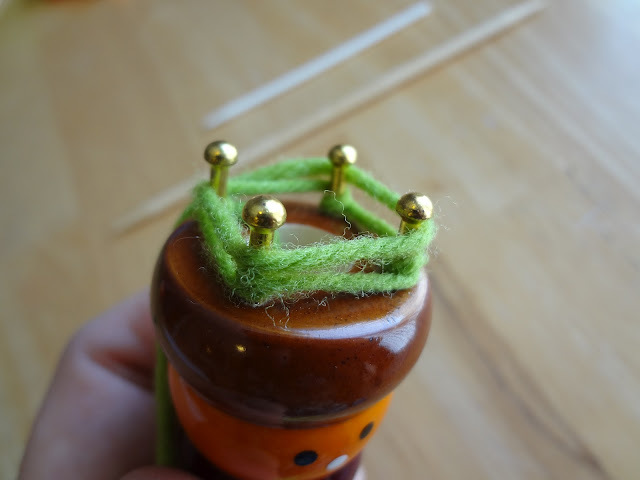 You can easily get one at a local yarn shop, craft store, fabric store, amazon.com, etc. 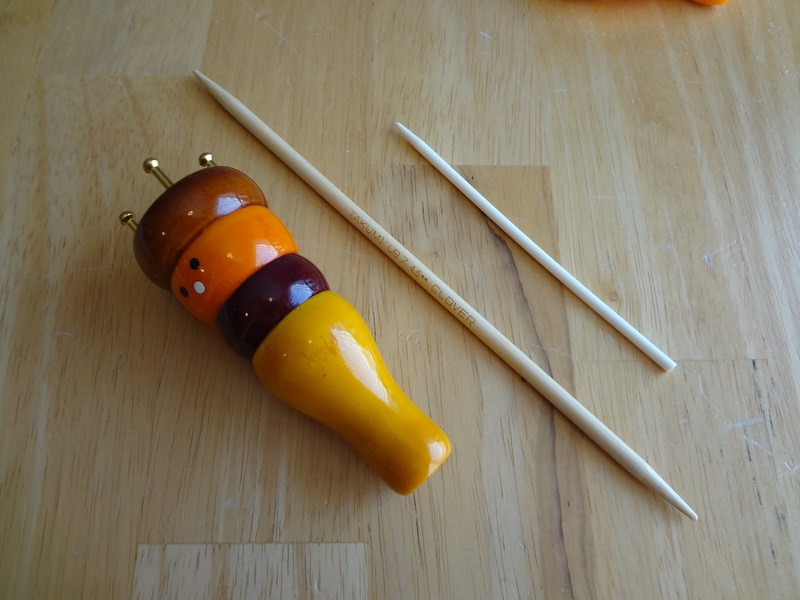 I also saw some gorgeous antiquey ones on ebay...might be fun to hunt for one too at your local antique shop. Most spools come with a small stick, if you don't have one, you can use a narrow DPN, experiment with the size until you find one that works best with your spool. 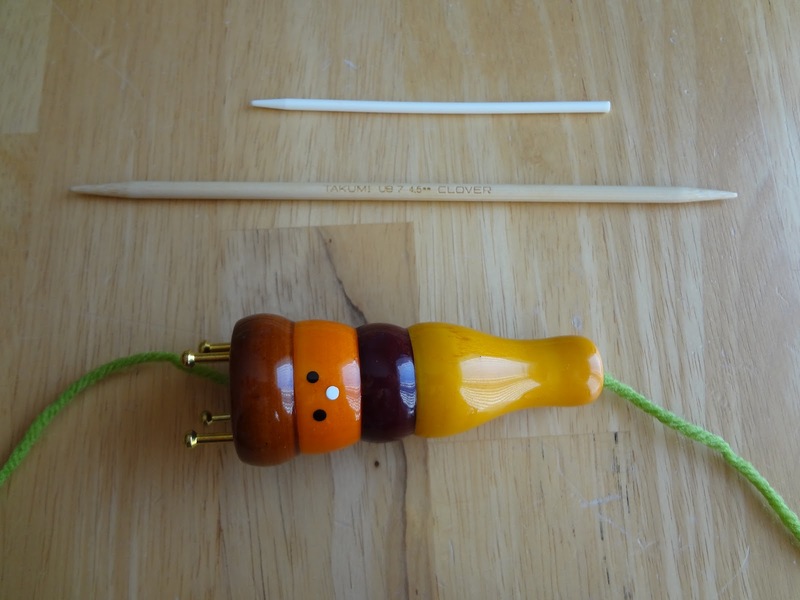 The stick mine came with is made of plastic and a had a little too much flex in it for me...I chose to use a bamboo US7 DPN instead, but definitely choose the size you feel most comfortable handling. 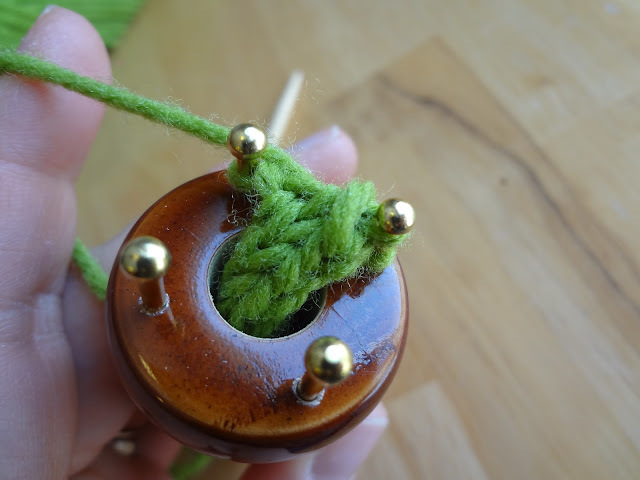 Pull a strand of yarn through the hole of the spool from the top until a short end comes through the bottom of the spool. 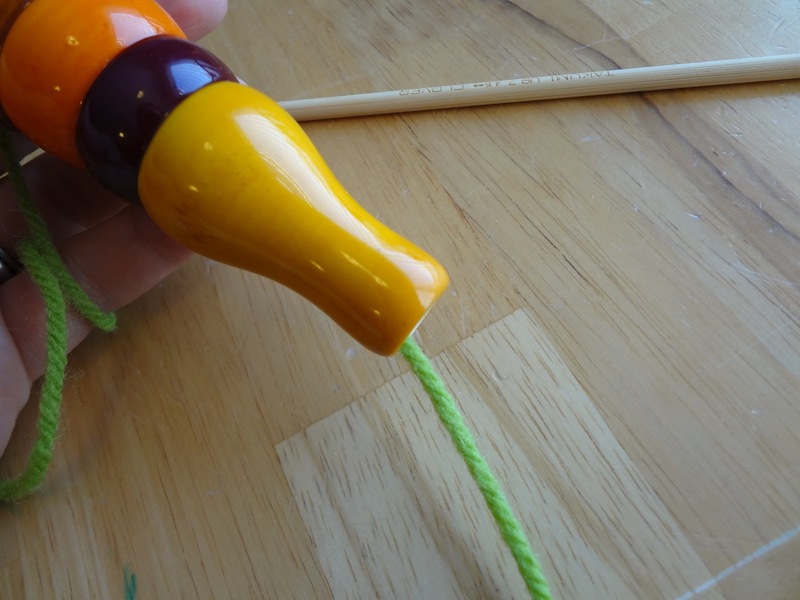 Hold the French Knitter top with thumb facing, yarn is held and runs over the top of your index finger. The middle and ring fingers hold both yarn and base of French Knitter. 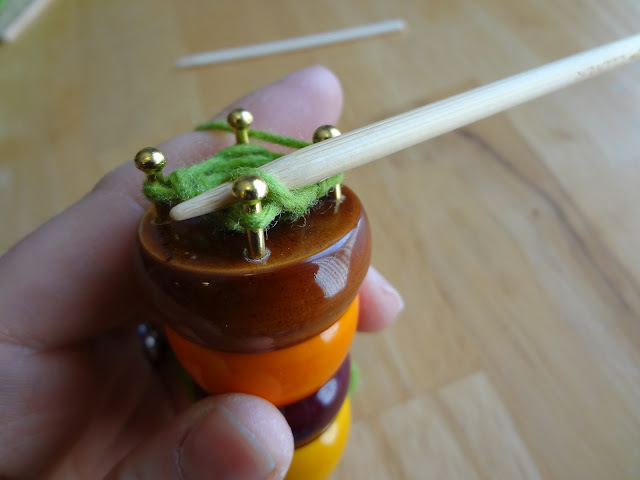 Hold the needle/DPN as you would hold your knitting needle. 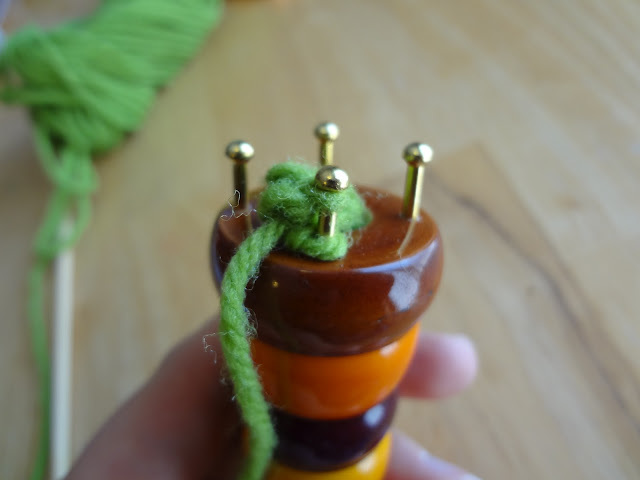 To cast on, wind the yarn around the pins counterclockwise as shown...take care not to do this too tightly or it will extremely difficult and/or impossible to complete the first round. 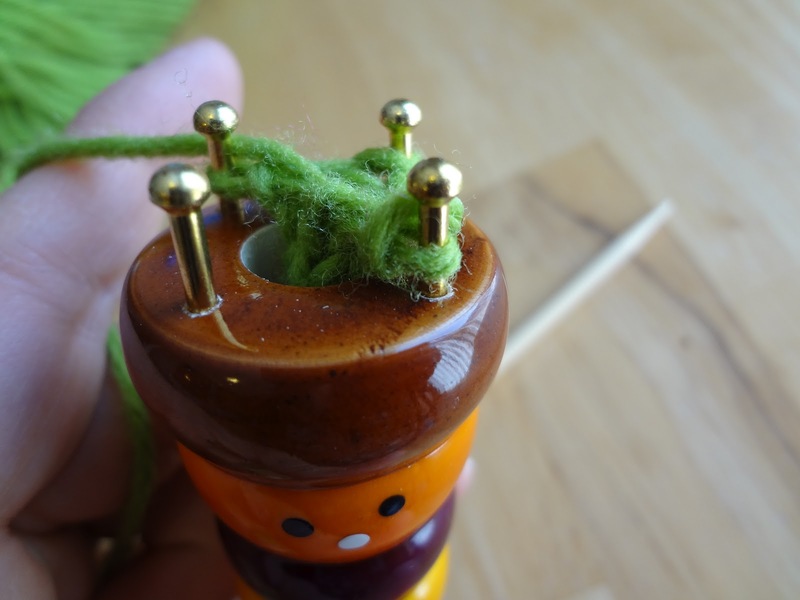 Using the needle/DPN in your right hand, lift the loop over each pin head and over the yarn wound around the outside of the four pins, working in a counter clockwise direction. Continue working in this manner until only one loop remains on the pin. 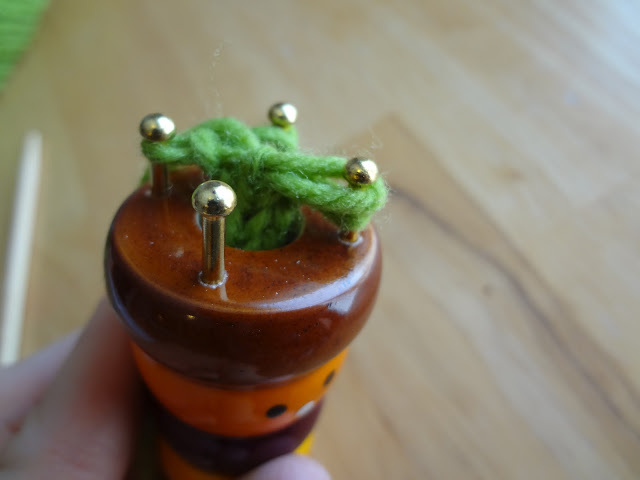 Then carefully slip it off of the pin and fasten off. 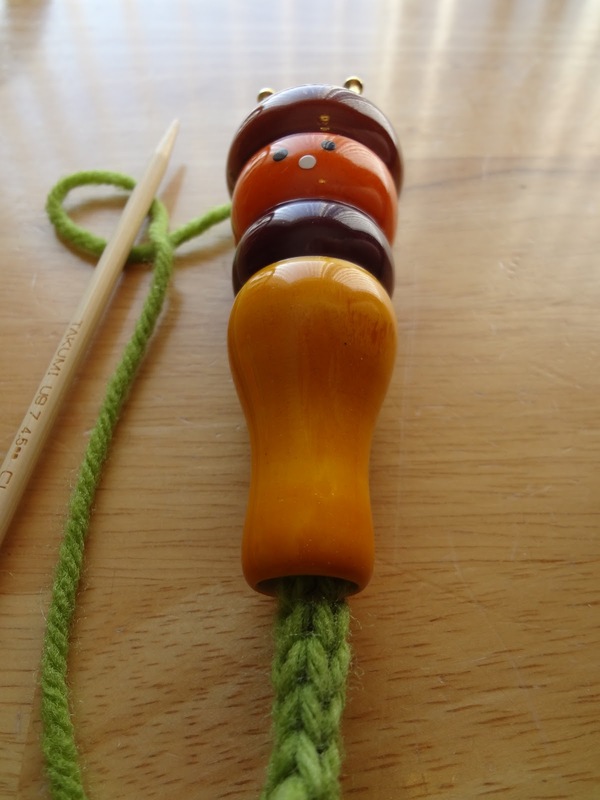 Or, you can simply cut a tail and thread it through each loop and pull tightly and fasten off, similarly to finishing off the top of a hat in the round. There you have it! Try experimenting with different kinds of yarns for interesting and beautiful effects! Here is a simple pattern to use your new skill! 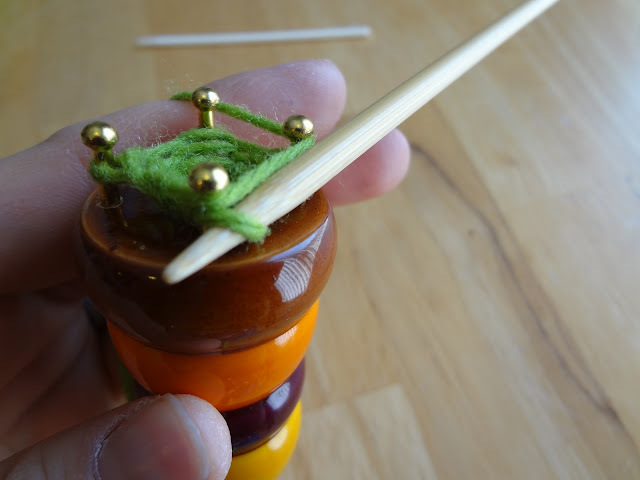 I remember my mother telling me that in her school days, they used to take the wooden thread spools from sewing machines, – I guess they already had holes in them from which the cord could emerge, hammer four small nails, and start cording with a knitting needle, open at both ends. 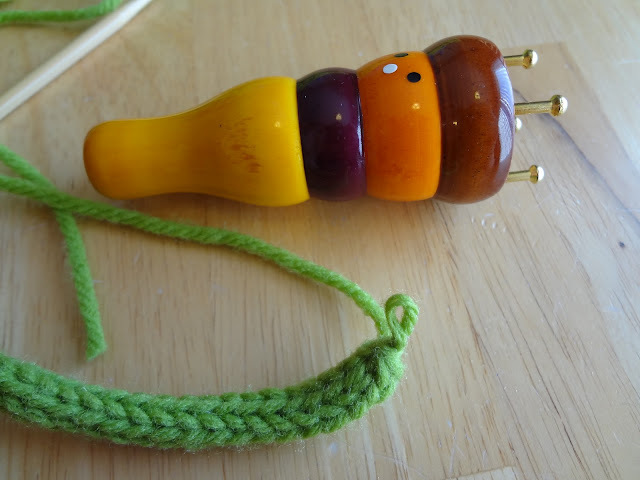 When I showed this to her, – I found it on eBay – she told me that I could make one myself!